In 1976, Dr. Carl Jensen founded Project Censored at Sonoma State University. He developed the Project to research and publicize news media censorship in the US and to develop students’ critical thinking skills and media literacy. The Project produced its first list of important but under-reported news stories in 1976. Jensen and Project Censored circulated the earliest annual reports in mimeographed form. From early on, Bruce Brugmann helped to increase the Project’s impact by publishing Project Censored’s annual report of the “news that didn’t make the news” in the San Francisco Bay Guardian. The Shelburne Press (Chapel Hill, NC) published the first Censored yearbook, Censored: The News That Didn’t Make the News—And Why, edited by Carl Jensen, in 1993. In addition to the Top 25 Censored Stories of 1992, the initial volume included chapters on Junk Food News (a term that Jensen coined), an update on the status of previously censored news stories (Deja Vu News), and a chronology of censorship dating back to 605 BC. The 1994 and 1995 Censored yearbooks, also edited by Jensen, were published by Four Walls Eight Windows (New York). 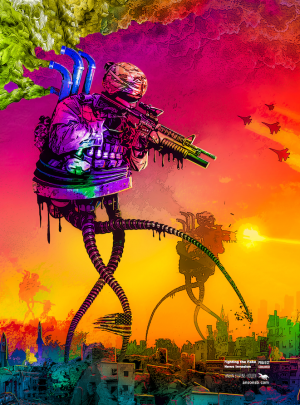 Jensen recruited an illustrious panel of media experts—including Noam Chomsky, Susan Faludi, George Gerbner, Edward Herman, Sut Jhally, Nicholas Johnson, Judith Krug, Michael Parenti, and Herbert Schiller—to serve as judges of the Project’s annual story lists. 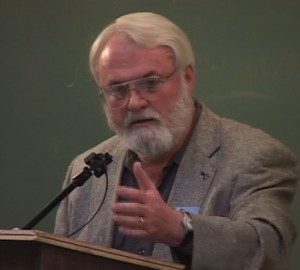 Dr. Peter Phillips, a sociologist at Sonoma State University, became director in 1996 and continued to expand the annual book and educational outreach. From 1997-2011, Phillips edited or co-edited fourteen volumes of the Censored yearbook, all published with Seven Stories Press (New York). During this time, accolades for the Project included two Firecracker Alternative Book Awards and the 2008 PEN Oakland National Literary Censorship Award. In 2000, Phillips and Jensen established the Media Freedom Foundation, a 501(c)3 nonprofit organization in order to provide oversight for the Project and to ensure its independence. Professor Mickey Huff of Diablo Valley College became director in 2010. Working with associate director Dr. Andy Lee Roth, Huff extended the Project’s educational reach beyond Sonoma State University through the Project’s Campus Affiliates Program, which Huff and Phillips launched in 2009. 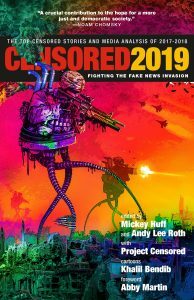 The Campus Affiliates Program now connects hundreds of faculty and students at colleges and universities across the US and around the world in the collective effort of identifying and researching each year’s top Censored news stories. In addition to the campus affiliates program, Project Censored continues to foster relations with numerous independent media groups and free speech organizations. In 2010, Phillips and Huff launched “The Project Censored Radio Show,” a weekly public affairs program originating from KPFA in Berkeley, California, part of the Pacifica network. The program, now hosted primarily by Huff, is syndicated on forty radio stations across North America. In 2013 became part of the National Coalition Against Censorship. The Project received the National Whistleblower Center’s Pillar Award for New Media and Journalism in 2014. 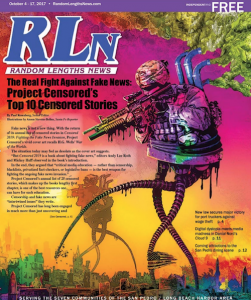 In recent years, Random Lengths News, published by James Preston Allen out of San Pedro, California, has covered the Project’s annual story lists. In communities across the US, dozens of independent newspapers affiliated with the Association of Alternative Newsweeklies run the content provided by Random Length News in feature stories each year. The Project has been the subject of two documentary films. Project Censored: Is the Press Really Free? (1998), directed and produced by Steven Keller, aired on PBS stations across the US in May 2000. In 2013, Doug Hecker and Christopher Oscar produced and directed Project Censored: The Movie: Ending the Reign of Junk Food News, which premiered at the Sonoma International Film Festival in April 2013, the Bend Film Festival in October 2013, and the Madrid International Film Festival in July 2013, where Hecker and Oscar were recognized for Best Directing of a Feature Documentary. The Project’s Media Freedom Summit, held at Sonoma State University in October of 2016, convened journalists, media studies scholars and activists from around the world to celebrate the Project’s fortieth anniversary. Workshops and panels addressed the links between media power and political power, promoting media freedom and critical media literacy as means to advance social justice. 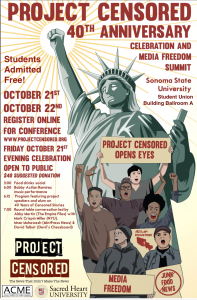 Building on the success of this event, the Project hosted Media Freedom Summit 2.0, focusing on critical media literacy for social justice, at the College of Marin in October of 2018. In the same month, the Mt. Diablo Peace and Justice Center honored the Project with a certificate of special recognition from Congressman Mark DeSaulnier (CA-11) for the Project’s outstanding and invaluable service to the community.